You might do a lot of things at Emerald City Comicon that your friends back home want to hear about. But if there's one event that's going to make them outright jealous, it might be this. 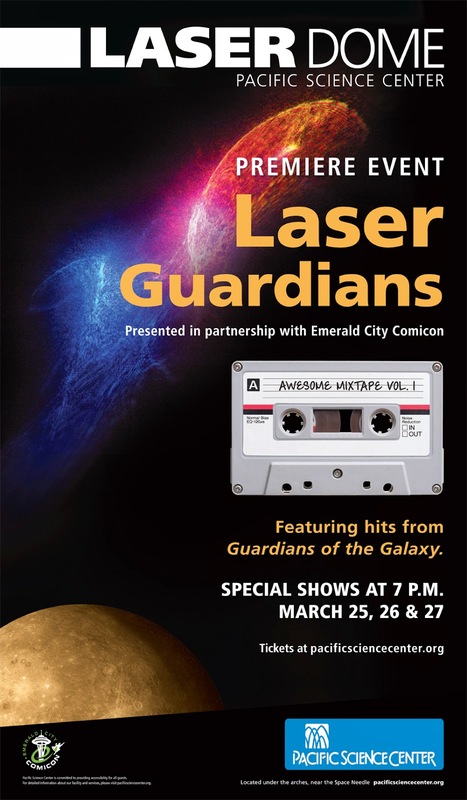 ECCC is bringing you a Guardians of the Galaxy-themed laser light show, Laser Guardians: Awesome Mixtape Vol 1. "At 80 feet in diameter, experience the largest and longest operating domed laser theatre in the world. See brilliant laser imagery performed live with a spectrum of colors and effects by the world's foremost laser artists, and all mixed during the show in a fusion of 15,000 watts of digital sound." Tickets are only $10, available now from PacSci. As far as I can tell, this is open to the public - you don't have to be a badge-holder - and I imagine it'll be pretty popular. So don't wait too long. If you've always wanted to hear "Cherry Bomb" while your brain transcends dimensions from sensory overload, this is your chance.